Kieran Doherty of Nancy’s Barn, in the beautiful seaside village of Ballyliffin, has been doing Donegal proud Nationally and Internationally, over the past few months. Kieran and his team accepted a VIP invitation during the Summer, from Southern Ocean County Chamber of Commerce, Long Beach Island, New Jersey, to take part in their Great Chowder Cook Off. Kieran cooked up 250 gallons of his famous chowder, which won the World Chowder Cook-Off in Rhode Island in 2017. The seafood dish was accompanied by over 1,000 individual seaweed and cracked black pepper soda breads hand-made by Edel Duey, Kieran’s sister. A host of VIP guests sampled the delicious Nancy’s Barn chowder including Tony Luke Jr, actor, restaurateur and founder of the famous Philly Cheese Steak. Tony gave Nancy’s Barn his number one vote and promised to visit Ballyliffin in Spring 2019. Kieran and his team have worked tirelessly to promote their independent Irish business and Irish tourism on a global stage and are proud to have enjoyed much success. 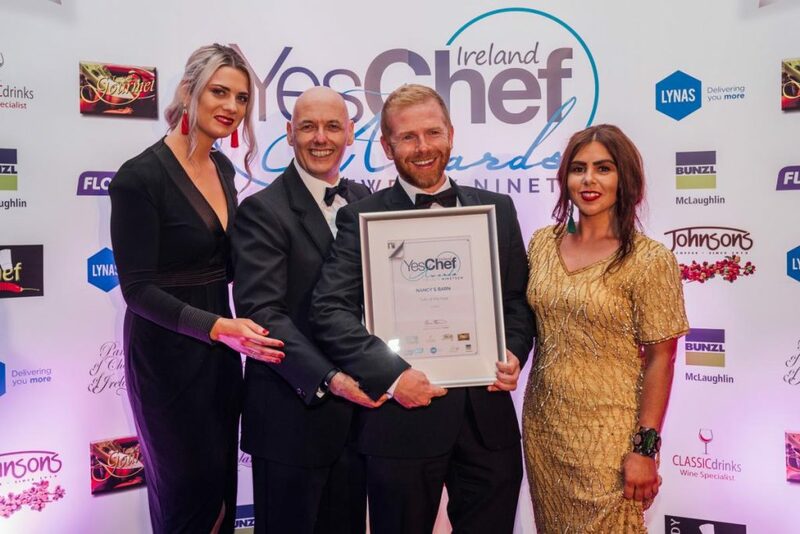 Following their international successes, the Nancy’s Barn team headed straight to the ‘Yes Chef Awards’ 2019 ceremony in Sligo, where they were put forward for two prestigious food industry awards after a secret judging process. Winning ‘Café of the Year’ 2019, has certainly been the icing on the cake in their success story this year. Kieran is elated to add this additional award to his growing collection and wants to thank all those who have been involved in the achievements of the past few years. Kieran added: “We live in a beautiful country with amazing people, food and scenery, all of which make it easy to sell to those willing to come and visit”. “I would advise all foodies, people in tourism and hospitality to jump at any opportunity and go for gold. It is only going to get better as more and more people find out about us here in Inishowen, County Donegal and Ireland,” he said. Kieran will now take a break before getting back into the Nancy’s Barn kitchen. There are also great plans afoot to take Nancy’s Wandering Wagon out and about around Inishowen and Christmas events are just around the corner. Well done to to Kieran and his team from all at Donegal Food Tours!